The sun was scorching the day we arrived at Gifft Hill School for the umbrella donation and installation. As we walked down the path to the play area, we were increasingly aware of the heat reflecting from every surface, and wondered how the school children had fared during the months following the hurricane, without any shade. We imagined their exhaustion after playing in the hot sun before returning to their classrooms. Gifft Hill School was founded in 1978 under the name Pine Peace, with only four preschool students in attendance. In 1982, a building was constructed on the lower campus through the donations of generous community members. In 2004, Pine Peace merged with the existing middle school, forming Gifft Hill School. Today, approximately 170 kindergarten-through-12th-grade students attend school on the 14-acre campus. 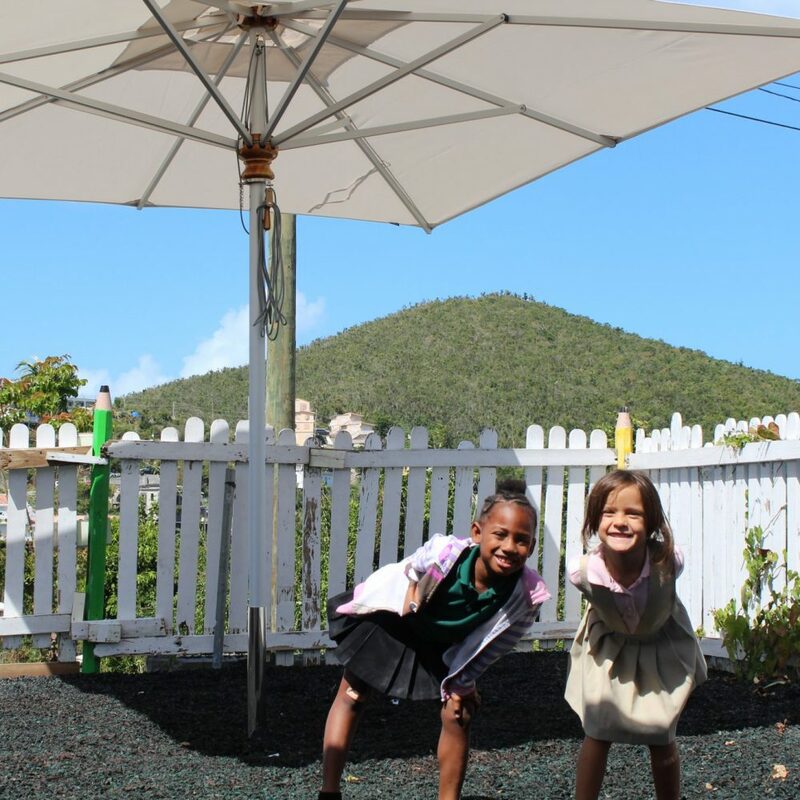 Prior to our arrival on St. John, the Gifft Hill staff chose two large 10×13 rectangular umbrellas in a natural color as the perfect fit for their large playground. After installing the centerpost umbrellas, the children enthusiastically dove into the perfect “shade rectangles” created on the playground surface, sweetly laughing and playing with one another, celebrating their new shade. Dr. Laurie, Head of School, was impressed by the size, strength, and beauty of the giant umbrellas made in South Africa. In addition to providing a functional purpose, they greatly improved the space for the children and staff, making the area appear more special and complete. In the days following the umbrella installation, we reached out to the school to ask if they wanted to share anything with our followers about their school. We received the following response, further demonstrating the depth of gratitude from the people of St. John for the assistance they have received from so many supporters since the storms. We are honored to be a part of the island’s restoration. We greatly enjoyed our time at Gifft Hill School, getting to know the staff and children, and learning more about this special island school which is clearly loved by the entire community! The motto of the school, “Cultivating Strong Minds and Caring Hearts,” is defined by their “whole student” approach, encompassing three core principles: Academics – with an emphasis on college and career preparation, and self-reflective, critical thinking; Experiential Education – learning to farm and sell the items grown in their gardens, and utilizing the National Park and Caribbean Sea as their living laboratories; and Compassionate Community – with a focus on sustainability, island and global partnerships, and a diverse student body. Not only do the children benefit from these programs, the island also reaps a reward with the “Gifft Hill School Gives Back” days, where the children learn to give back and “pay it forward” to the island and community. Throughout our day at the school, we had the pleasure of seeing these concepts demonstrated first hand by the students and staff. We greatly enjoy following the Gifft Hill Facebook page, which provides a wealth of information about the students and school activities!